Summer is in full swing. The heat wave my area was experiencing has finally broken and we’re beginning to get some rain again. As I type this I’m listening to the sound of distant thunder and watching the skies darken and winds pick up. That’s ok, I’ll take it. Our veggies need the rain, just none of that bad stuff or hail please. In between swatting at mosquitos my husband and I have enjoyed some really great summer wines. 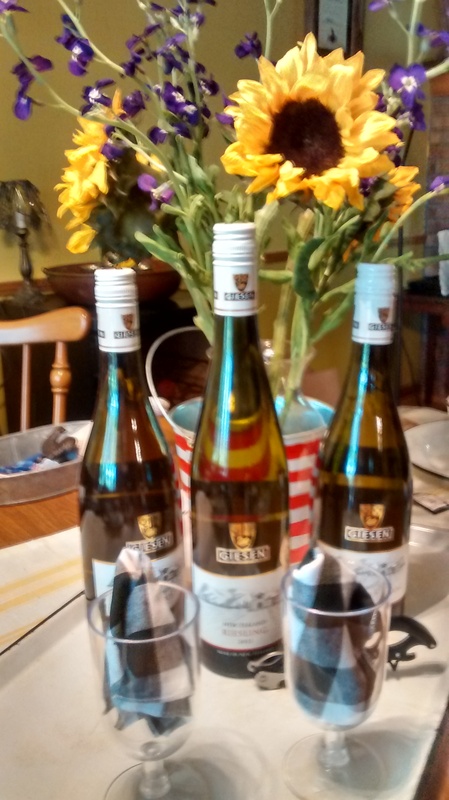 In my last post I told you about the wine samples I received from Giesen Wines. The Sauvignon Blanc is just as good as the Pinot Gris and very traditional in the New Zealand style. Classic Sauvignon Blanc aromas with eucalyptus, apricot and lime. Fresh and vibrant flavors bursting with peach, apricot and zesty citrus. Well balanced and bright acidity and a long dry finish. Light, refreshing and perfect summer wine. While we wait patiently (ok, I’m getting a little impatient) for our summer veggies to come in, I was able to pick up some local grown zucchini while in Raleigh. We used some in salad but I still had a lot left so, in an effort to use up the zucchini and some eggs, always trying to use up the eggs, I made a summer zucchini pie. I also had some left over mashed potatoes and a great Iowa ham steak, which I turned into my version of ham croquettes. I even used one of my Granny’s pretty baking dishes. It’s probably a pie dish but I don’t make pies so I’ve started using it for pretty summer dishes. Preheat oven to 350°F. Combine beaten eggs, mustard, onion and cheese, spices and baking powder in a large bowl, reserving 1 tablespoon of the Parmesan. Grease bottom of baking dish with butter. Lay puff pastry in dish, fold over edges or just leave them to hang over. Layer (don’t stack) 2 or 3 slices high enough of the zucchini to cover the bottom of pastry, pour mixture over just to cover, layer more zucchini and pour remaining mixture, finish final layer with zucchini. I love cheese so I added a little more at this point. Bake for 45 to 50 minutes or until golden brown. Sprinkle with the reserved Parmesan. Cool 10 to 15 minutes before slicing. My husband and I are staying close to home this weekend. We decided to use the green house as a chicken nursery as we expect to have hatching chicks come July 6. We’re also hoping to get the new and bigger chicken coop framed out. Good thing we were planning to do it as our flock may be expanding soon. We currently have two hens sitting on nests. Oh boy, more eggs to get rid of… better start looking for more egg recipes. If anyone has any, send them my way. This entry was posted in Cooking, Countries, New Zealand, Summer wines, White wine and tagged giesen, marlborough, Sauvignon Blanc, summer veggies, Summer Wines, Wine Chicks Guide, zucchini pie. Bookmark the permalink.